Most soils have moisture down deep, but in drying conditions, roots are static, which results in limited nutrient uptake and inhibits roots from growing into that deeper moisture. Efficient nutrient delivery is best achieved by foliar pathways. Foliar application will stimulate the root growth and drive roots deeper through nutrient and moisture depletion zones and into moisture reserves. This delays premature aging, i.e. bolting or senescence. Help bridge the gap during a dry spell and enhance uptake. This foliar nutrition strategy applies to both crops and pastures, allowing animals to continue getting their nutrients in the most effective way, directly through the plant. It is well documented that cereal crops develop the length of their head during the early stages of growth. It is during the 3-4 leaf stage (Zadock 14-20) that the floral or spike initiation is carried out, with the crop determining the length of spike or otherwise the number of spikelets or florets needed to be produced. The number of spikelets is influenced by day length, temperature, and nutrition, from which the latter is the only aspect we can manipulate. This has been seen with starter applications of nitrogen and phosphorus, which play an integral role, however, deficiencies of any nutrient can reduce the potential number of spikelets. Each spikelet can produce 2-5 grains, therefore by increasing the number of spikelets the potential for more grain and yield is increased. The greatest effect of starter applications will be on tillers that are typically further down the pecking order as the main tiller will usually get first preference of resources. Often when nutrients, are deficient, particularly trace minerals, symptoms are not always visible on the leaf. Yet, analysis of the leaf tissue will accurately show the elements that are deficient and the elements that require the most attention. With this information, growers can apply the nutrients that the crop needs, without supplying unnecessary nutrients that will have less impact on yield potential. 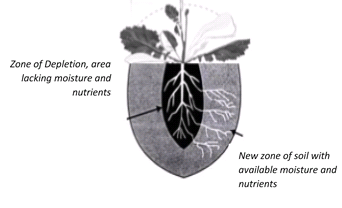 By supplementing potential deficiencies during Z14-20 with foliar nutrients growers are better able to achieve nutrient level balance in the plants. 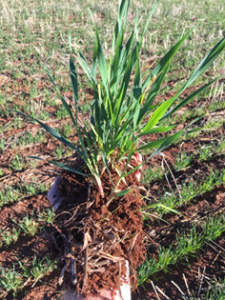 This balance helps achieve maximum tiller numbers and increases potential spikelets, allowing for greater inflows of nutrients to be stored to achieve for maximum grain fill. This sequence of photos shows the formation of a wheat plants spikes development, through to the formation of individual florets. All this occurs during Z14-20.